I saw this quote this morning and it made me nod in agreement. 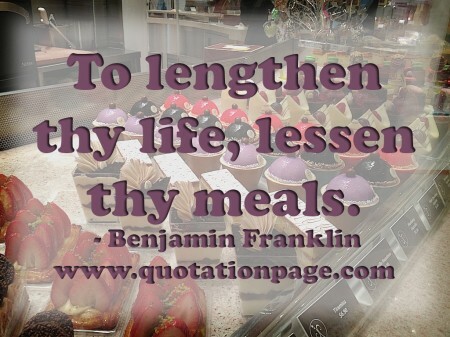 To lengthen thy life lessen thy meals. You don’t need to starve. You don’t need to change everything about what you eat. All you need to do is LESSEN. Make all of your meals a tad smaller and you will live longer. That’s all you need to do. Being fit is 80% what you eat and 20% exercise. You can’t outrun your fork, so put it DOWN. Eat a little bit less and you will be healthier and happier.